Here's a must have for all women who have a passion for photography AND still want to look trendy and fashionable. A camera bag that also holds your other personal items: wallet, mobile phone, keys, pen, pocket notebook and other essentials. Featured above is the Ginger Epiphanie handbag. 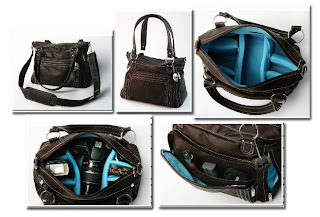 I have been wishing (in silence) for this camera handbag. I just love everything about it: it's big at 14x8x10 inches, chocolate brown, stylish, has lots of pockets and compartments, has extra padding for extra camera protection, and even has a removable cross-body strap. Remember me losing our SD card containing our photos from Keukenhof, Netherlands? That's because I just inserted it in my wallet and it must have slipped. It wouldn't go missing if I had a bag like this one. Or am I just pointing fingers here? Hehe! But really, I wish I could have one just like this. I can easily purchase one if I really want to. But alas, I have to save up for my laptop. It is much more needed than a camera handbag right now. But really, our little Niki could use a home in Ginger. Now, who wants to donate?